to the FOURTH REVISED and UPDATED EDITION! Available in this trade paperback and e-book versions only available from Overlook Connection Press. ONLY FOUND IN THE OVERLOOK CONNECTION PRESS EDITIONS! As with Rocky Wood's 2012 Revised and Expanded edition of Stephen King: Uncollected, Unpublished, this 2014 Update is an addendum to that volume and features many, many new and rare Stephen King pieces not previously discussed. = A poem lost since King’s college days. = Two unpublished short stories from the 1970s. = A story that won King a prize (and a lecture) when he was in High School. Important updates are provided to information about these previously known works – After the Play; King’s senior Class Day play (including its title, content, and comments from King); and the story King wrote in fifth grade about his classmates being taken hostage. A number of stories King is rumored to have written are dealt with. Some obscure stories have been republished in easy to access form and that information is provided for readers. A centerpiece of this Update is the full description of a lengthy busted novel – Phil and Sundance. In addition, a new busted story that appeared to have great promise is described. ABOUT THE AUTHOR: ROCKY WOOD. Rocky Wood's unabashed sense of detail and research on Stephen King and his work has brought many readers new insight into this author's rare work. He is also the current President of the Horror Writers Association, and is constantly working towards the betterment of writers within the horror genre. His previous publications also include Stephen King: A Literary Companion, Horrors! Great Stories of Fear and Their Creators by Rocky Wood (and illustrated by Glenn Chadbourne), and Stephen King: The Non-Fiction by Rocky Wood and Justin Brooks. The 2012 edition of STEPHEN KING: UNCOLLECTED, UNPUBLISHED features many new contributions on Stephen King's work never before seen. He is also the author of two graphic novels, including Witch Hunts! A Graphic History of the Burning Times, which won the 2012 Bram Stoker Award for Superior Achievement in a Graphic Novel. A companion piece to the original SKUU Expanded version features the cover in a green glow identifying with the 2012 SKUU Revised Fourth Expanded edition, in the light glowing cover. These should sit side-by-side on your shelf. These unique covers were commisioned by OCP with artist Erik Wilson. The design is based on the idea on where Stephen King gets his ideas... from a little "idea" shop that he has mentioned over the years. You can see the light coming out through the front door, and titles of his stories are streaming through the light, with Stephen King in the doorway. 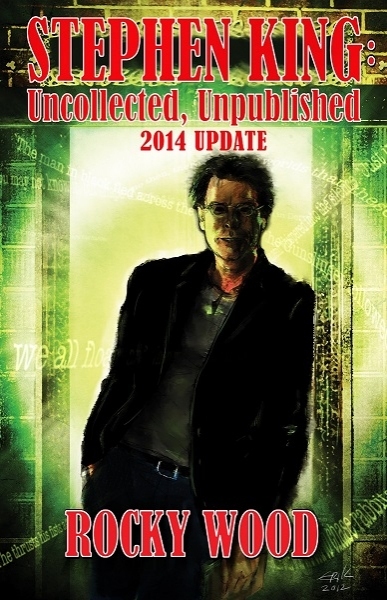 This is a fitting cover for all the ideas and stories that are discussed within Stephen King: Uncollected, Unpublished.